The Legislators Aloft project was initiated to facilitate the transfer of research and conservation messages directly from scientists to decision makers. 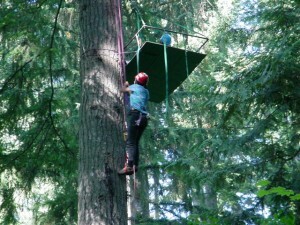 In 2002, twelve Washington State legislators and their aides were invited to join forest canopy researchers and conservationists for a day in the forest, climbing trees. Platforms were installed in trees at a height of 60 feet. 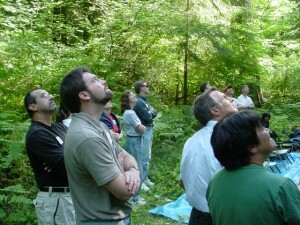 Participants were instructed in canopy access techniques. Researchers and legislators discussed topics of mutual interest: sustainability, biodiversity, and global climate change. In subsequent months, individuals contacted each other for information on these topics. Many scientists are interested in conveying their thoughts and research directly to decision makers, so that management decisions will more accurately reflect the current state of knowledge. This project provided a direct conduit for that communication. The relationships among participants continued beyond this event, demonstrating that this activity can have longterm positive effects. A post-session evaluation, a written questionaire distributed at the session with an email follow-up, documented that 80% of the legislative audience felt “positive” or “highly-positive” about the experience, and 75% stated they would be willing to contact a forest ecologist for advice or information about environmental issues in the future.